Along with muscle, tendon, cartilage and bone, your body is comprised of two different types of fats. These are subcutaneous and visceral fats. Subcutaneous fats are situated just beneath the skin and on top of the muscle. It is relatively easy to get rid of and not extraordinarily hazardous to your health unless you have a tremendous amount of it. Visceral fats surround the internal organs, and they can increase your risk of heart disease and many other, serious ailments. These two types of fats are the most important thing to understand if you want to learn how to lose belly fat fast and with lasting results. Every good weight loss plan will include both cardiovascular training and strength-building elements. You cannot slim down by doing one, or the other sustained weight loss requires both. Just cutting calories can have a devastating and long-lasting impact on your metabolism. Running, jogging, and dancing are all good forms of cardiovascular exercise. Cycling, swimming, and walking are other options. The goal of these efforts is to create a calorie deficit, meaning that you are burning off more calories than you are consuming. This shortfall is what causes the body to shed pounds, and it is particularly useful for getting rid of stubborn, visceral fat deposits. Strength training builds up lean muscle mass. It also fosters good bone and joint health and a more robust metabolism. These exercises can include toning activities like lunges and squats, as well as sit-ups, crunches, and other targeted activities. Regarding your diet, be less mindful of the amount of food that you’re eating and only focus on filling up on good things instead. Eat plenty of fresh, healthy and nutrient-dense, while avoiding fast food, junk food and anything that is packaged and ready-made. Finally, be consistent. 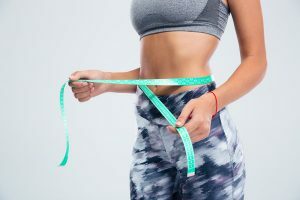 It takes several weeks or even months to achieve noticeable changes, but over time, you’re virtually guaranteed to get a slimmer, fitter and more attractive waistline overall.